But the Menton lemon has always been special. It’s a very bright yellow, elongated rather than round, and prized by chefs for its rich essential oil. If you’re still unconvinced about the appeal of a lemon-based gathering, this is no botanical show. Each year is themed. Look into the program to this years theme. 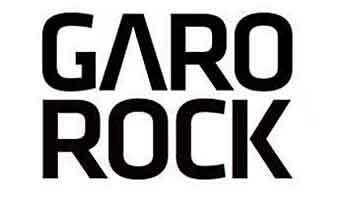 The program use to be published in October on their website fete-du-citron.com. 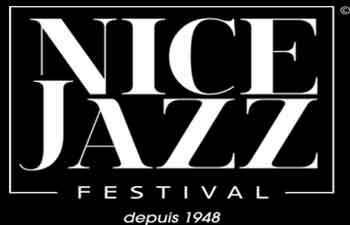 While Menton is proud of its internationally-famous product, it doesn’t always take its festival too seriously. The Menton Lemon Festival is one of a kind. According to the story, Menton grew from a pip, to become the prime lemon-growing region in Europe. An exhibition of flowers and citrus fruit first started in the early 20th century, and was so successful that the event soon took over Menton’s winding streets. At the heart of the festival, magnificent lemon-themed parades take place day and night, with stilt-walkers, fire-eaters, musicians and acrobats providing a spectacular performance. This year’s floats will feature creatures of the deep – dolphins, whales, giant squid and fantasy fauna will take over every festival venue, with citrus-scented works of art, all created from carefully-placed oranges, lemons and glorious Mediterranean flowers. See more from Menton’s tourist office, and prepare to be astonished by the artistic uses of a little yellow lemon. 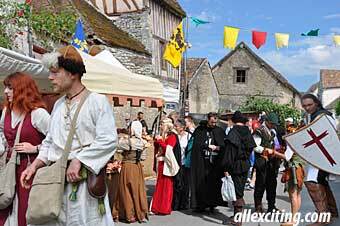 The Citron Festival often clashes with Nice Carnival and the Mimosa celebrations at Mandelieu. Check out the dates and see if you can catch all three festivals. Menton’s gardens are a well-loved attraction all year round, their kaleidoscopic displays offering constantly-changing and colour-filled vistas. During the festival, the Biovès Gardens take on dazzling hues of yellow and orange, the colours of a Riviera sunset. See these ephemeral sculptures by day, then come back in the evening for magical, spotlit gardens of enchantment. The Gardens of Light take on a new look, illuminated as the sun goes down, and filled with extraordinary sounds. 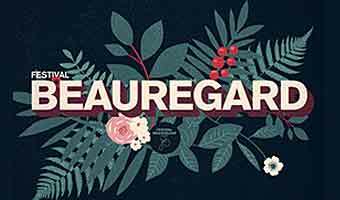 Take a glimpse here – it’s hard to imagine the creativity that fruit and flowers inspire. If your tastes are more exotic, alongside the Lemon Festival the lovely Palais de l’Europe hosts the Festival of Orchids and Crafts. The Orchids flourish in their own garden, rivaling one another for color, fanciful form, and seductive scent. Like the carnival, these striking blooms will be ready to take you on a journey to a fantasy-land. At the Arts and Crafts show, local artisans present their skilled work: sculptures, glass blowing and engraving, ceramics, and of course, citrus flavors added to the local dishes that make up Menton’s gourmet appeal. Don’t pass up on the chance to taste the region’s specialties – maybe “un bouquet de fleurs de courgettes”, delicate courgette flowers in a light and fragrant batter. You might well find yourself musing about booking for next year’s lemon extravaganza – and keeping a corner of your suitcase for a few of those inimitable golden fruit. It’s of course a good idea to book well in advance as all available rooms tends to be sold out very quick for this period. 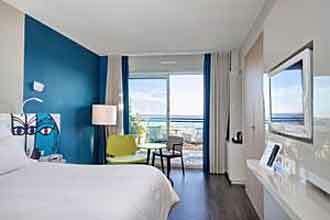 An alternative is to stay in Nice with many more possible accommodations for your stay. Three 4 star hotels in Menton, including the popular Hotel Napoleon, right on the seafront, which has a cosmopolitan feel. Some 3 star hotels are actually more impressive than you might expect, such as Princess Et Richmond and the palatial looking Le Royal Westminster. For a start, its position on the edge of a crescent bay, perched between Monaco and the Italian Riviera, produces a perfect microclimate, with more than three hundred days of sunshine per year. With the soaring Alpes Maritimes mountains behind you and the azure of the Mediterranean in front, you could ski in the morning and bathe in a warm sea in the evening. Add to that its imposing Italianate architecture, its mouth-watering French cuisine – and no pesky mosquitoes! No wonder then, that this part of the Côte d’Azur has always been a huge draw for visitors. 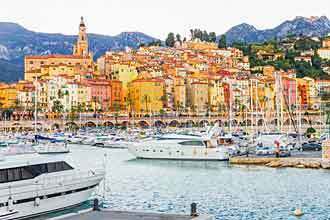 The lure of nearby Monte Carlo and Nice makes Menton an ideal base for a tour of the swanky French Riviera, and those in the know come back all year round for its fabulous festivals. 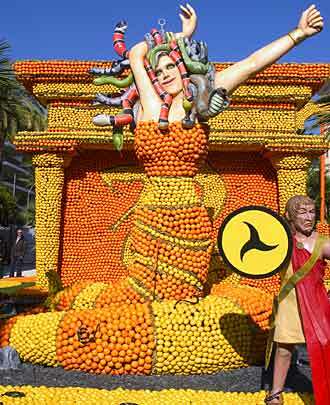 But only Menton has a celebration of citrus fruit. Warmer than Nice, Menton has one of the balmiest climates in France. People have visited Menton for decades, to escape the harsh winters of Northern Europe. Come for the weather, and you’ll be following in famous footsteps – Menton was favoured by Queen Victoria, and still attracts contemporary celebrities. Keep an eye open and even if you don’t see a Royal, you might spot a famous face from stage or screen. All that sea air, sunshine and soft breezes will leave you with the glow of summer, as some Europeans shiver and add another warm layer of clothes. If you can’t make it for the festival, in any season, Menton is a delight. Time seems to stand still here, in a world of unimagined splendour, and before you know it, you’ve fallen in love.